The Toshiba XDE-600 is the second generation of DVD players to feature Toshibas' coveted upscaling technology that attempts to upscale your existing DVDs to 1080p, commonly known as XDE. There's a big difference between DVD and Blu-ray's picture quality, but Toshiba's eXtended Detail Enhancement (XDE) technology aims to narrow this margin. XDE garnered superb results on the first player to feature it, the XDE-500, by giving it the edge over most other budget upscalers on the market. Can this cheaper follow-up, the XDE-600 version cut the mustard? Inevitably, the XDE-600's build quality is a lot more 'budget' than its predecessor. The light, hollow sounding casing is, sadly, all too common among players at this price. But Toshiba has at least given it a fashionable, gloss-black finish, accentuated by a distinctive grey slope at the bottom. On the fascia you'll find a limited display panel and a USB port for playing back digital media. Connections include the all important HDMI output, which delivers 720p, 1080i or 1080p images to your TV. It'll even output NTSC discs at 1080/24p, but, as it's locked into Region 2 it's not much use (unless you get the deck chipped of course). You can convert PAL to NTSC and activate 24Hz, but the results are unwatchable. The XDE-600's media support is solid in that you can play DivX, XviD, MP3, WMA and JPEG files, although formats like DivX HD, WMV and MKV are a incompatible. Disc-wise, it spins most platters with the exception of DVD-RAM. Wisely, Toshiba has included XDE as an optional rather than blanket application. There are three different settings: 'Sharp' mode that casts its discerning eye over the picture and sharpens up detail; 'Colour' mode, which refines the hues (blue and green in particular) to natural levels, and 'Contrast' mode that emphasises detail visibility during dark scenes. Select either of these latter modes and 'Sharp' mode is automatically applied at the same time. As well as these show piece features, you get the complete range of DVD basics, such as a three stage zoom, slow-motion, frame advance and a speedy 10x scan mode. The 'Enhanced Audio' mode adds a 3D effect to stereo sound. We can't fault the setup menu, which features a common-sense structure, legible text and a responsive cursor, while the rest of the playback info (including the video bitrate) is clearly presented. This is just as well, considering the minimal front panel display is about as useful as a chocolate teapot. Controlling the deck with the remote is a breeze thanks to the spot-on button layout and labelling, and there's a dedicated button for toggling through the XDE modes, which makes comparison between them very easy. The impact XDE makes on the picture is instant and dramatic. We fired up The Departed at 1080p, activated 'Sharp' mode and revelled in the extra clarity given to fine details such as clothing, walls and skin. They become crisper and more pronounced, as if someone has suddenly focused the lens properly. Obviously, the effect doesn't come close to the intense clarity of a good Blu-ray picture, but the 'Sharp' function does provide that extra depth and punch missing from regular upscaled DVD pictures. Edges also look tighter and cleaner and the processing works its magic without introducing hard white lines around objects, as do so many of the cheap, standard DVD decks currently available. 'Colour' mode also delivers impressive results. With a shot of a blue sky visible through an office window, the XDE-600 makes the hue more vibrant and utterly realistic, without impinging on the scene's darker colours. Likewise, in shots of police recruits training next to a green field, this mode finds the perfect saturation level for the grass, making it look natural without touching other parts of the picture. But most impressive is the 'Contrast' mode, which emphasises shadows, while boosting the visibility of background objects during dark interior scenes. And, impressively, it does so without any detrimental side-effects. Turn it off and the detail gets swallowed up in the blackness. On the downside, XDE can be a bit of a double-edged sword. Some viewers might not like the way it can gently emphasise noise in the picture, but without it pictures look average, due to the soft detail and limited black level. On the whole though, the positives far outweigh the negatives. Playing CDs through the analogue outputs results in smooth sound quality, which might not offer the same dynamic range and neutrality of a similarly priced CD player, but is still very enjoyable. The quality of digitally-piped Dolby Digital and DTS tracks depends on the quality of your decoding equipment, but big action scenes sounded spectacular on our test system. Had this player not been equipped with XDE processing, we'd have been looking at a rather lacklustre performer, but this excellent technology really does boost picture quality above and beyond what you'd normally expect at this price. 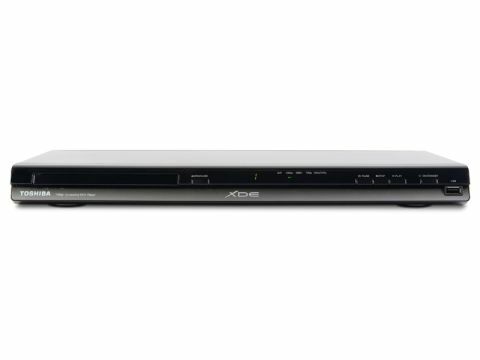 And when you take the deck's other features, connections and ease-of-use into the equation, we have to concede that the XDE-600 is one of the best budget upscaling DVD decks on the market.